Geraniums are one of the most widely known indoor and outdoor flowering plants cultivated around the world. They prefer high light conditions indoors or a sunny protected location outdoors. By far the most popular and the geraniums most often used outdoors and treated as annual bedding plants or grown in windowboxes and containers are the common zonal geraniums (Pelargonium x hortorum). The entire plant, including the flower stems are covered in minute fuzzy hairs. Plants are also easy to recognize by distinct markings or bands on their leaves. Depending on the variety, the color of these markings can be any shade of grey, silver, white, gold, red or purple. The bloom or flowerheads are comparatively large 2 to 4 inch globes made up of single or double florets displayed on an erect stem and well above the foliage. Flower colors include all possible shades of red, pink, purple, salmon and white. Some of the newer cultivars include bicolors as well. Ideal temperatures for growing geraniums are 70 to 80 degrees during the day and 60 to 65 degrees at night, which makes them very suitable to growing as houseplants on a sunny windowsill or porch. Soil should be fertile, slightly acidic and well-drained. If you are planning to grow geraniums in containers or window boxes, purchase light weight ready mixed soil suitable to geraniums which will contain the necessary nutrients for best plant development. Keep mixture slightly moist at all times and fertilize with slow release pellets or water soluble fertilizer applied at half strength every two weeks or so during the growing season. 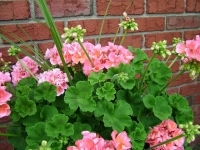 If grown outdoors, water geraniums during dry periods to prevent wilting. Soil should be kept reasonably moist, but never wet or soggy. Make a test by pressing a handful of soil in your palm. If it crumbles, the plants need to be watered. Thorougly soak the area around the plants and avoid overhead watering if possible to discourage disease and keep the flowers dry. Common garden geraniums are not winter hardy and are usually treated as annuals. They can easily be grown from seed. Another easy method of propagation is by tip cuttings, usually during late summer when plants have matured. Test by bending the top of a stem - if it snaps off readily, it is ideal for propagation. Avoid old woody stems, they are slower or less likely to root. Take 3 to 4 inch cuttings and strip off the stems, leaving 3 or 4 healthy leaves. Insert cuttings in flats of fresh seedling mix and keep moist. Roots should start to appear within 5 to 10 days. When roots are about an inch long, transfer to individual 4 inch pots and add a little bone meal to the potting mix. Again, keep moist and they will start making new growth in short time. Pinch out tips from time to time to encourage branching and to develop bushy plants. Keep them inside in a frost-free place where they can get as much light as possible and fertilize lightly once a month. Your new geraniums should develop into sturdy plants, ready to be put outdoors in spring when all danger of frost is over.